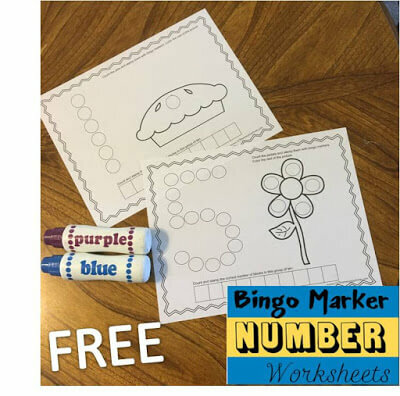 Preschoolers will love learning their numbers and practicing counting using these fun bingo marker math worksheets. These preschool worksheets will help children begin to learn to make their numbers plus practice counting from 1 to 12. Each of the 12 black and white worksheets includes a make the number, picture to complete, and a ten block. 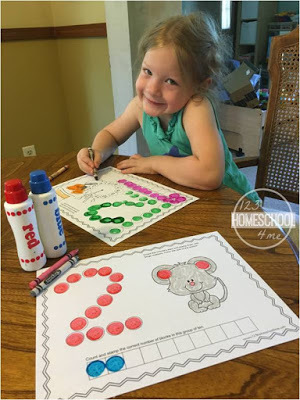 These pages were created to be used with bingo markers – a favorite school supply in our house! Kids will have so much fun using crayons, markers, bingo markers, or stickers to count and practice numbers 1-12. Should I wait to Send my Child to Kindergarten? Thanks for the free printables. I really appreciate it! How do I actually download the worksheets?